Click here to see past bags! 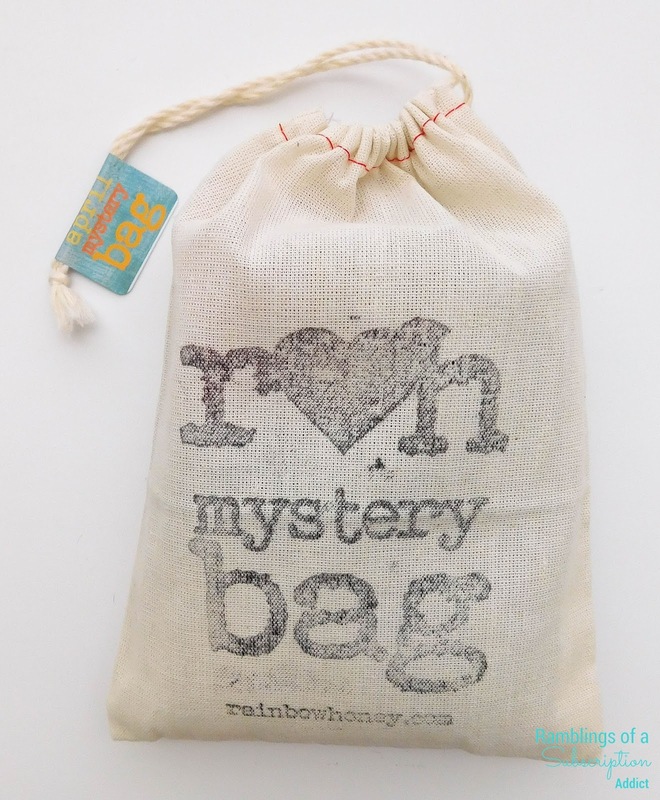 It's Summer colors for Rainbow Honey's April bag! The information sheet says that this bag's colors are inspired by weddings. I really need to figure out what to do with all of these bags. 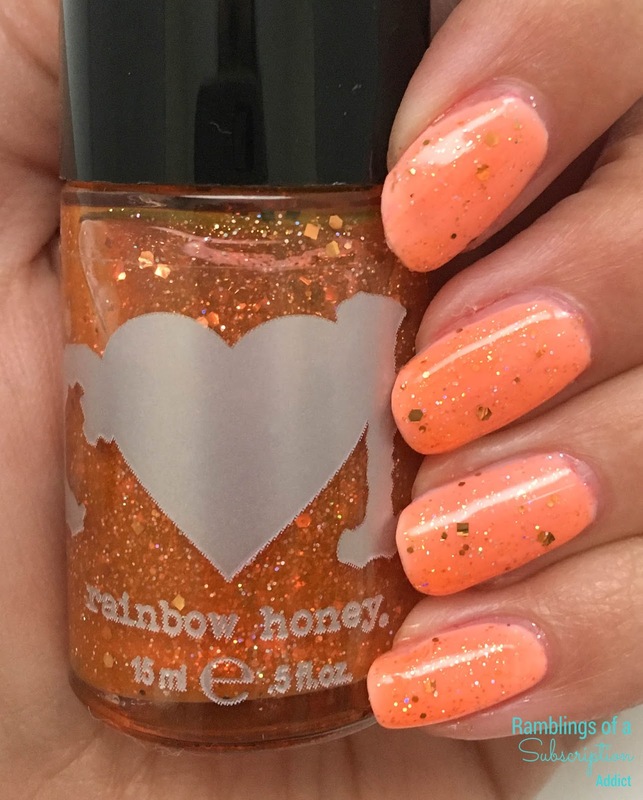 Summer Peach Tea (Glitter Topper) - This sparkling summer peach lacquer glistening with holo gold and silver dazzles your fingertips on a warm sunny day! Shown above is two coats of Summer Peach Tea over OPI's Funny Bunny and one coat of glossy top coat. Without a white base, this tends to blend into your skin/nail bed color. I decided to use the undie to make the orange pop to what it's capable of! It applies smoothly but does need a thin layer of top coat to smooth and add more shine! La Marguerite Rose (Creme) - Her name says it all! In honor of the wedding bouquet adorned by pink gerbera daisies, we've created a creamy blend of hot pink and magenta to capture this blooming beauty in a bottle! The best polish type that Rainbow Honey makes is definitely their cremes. La Marguerite Rose definitely reminds me of how much I love their formula and how perfectly they apply. Shown above is two coats of La Marguerite Rose with one thin coat of glossy top coat to add even more shine. Cooling Gel (Summer Peach Tea) - Enriched with tons of aloe for soft skin, our cooling gel not only cools you off during the summer, bud did you know it can be used in a variety of ways? I am Southern, so I believe the only true kind of tea is Sweet Tea. I drink hot tea, but that's for medicinal purposes only. While this Peach Tea isn't recognized by me, the scent is amazing and I will definitely be using it to moisturize my skin! Nourishing Lip Balm (Buttercreme) - Formulated to nourish and protect your lips. Packed with Maracuja Oil and Vitamin E, our nourishing lip balms will soothe and protect dry lips all year long! The Buttercreme flavor is a delicious, incredibly buttery and sweet icing flavor so good, it will remind you of cake, all day long! Oh my goodness, this definitely went in my purse as soon as I photographed it. It smells so(ooooooo) amazing and just like a cake. It is super moisturizing, just make sure your stomach is full when you wear it! Scented Topcoat (Summer Peach Tea) - Our glossy, fast drying scented top coat features Summer Peach tea, a juicy blend of summer peaches and herbal tea sure to brighten up your day, anytime! Some scented topcoats tend to just smell like bad topcoat, but this one doesn't. You can still smell the typical polish smell, but there is still Summer Peach Tea in it. I don't recommend sticking your nose to the bottle, but you will get a whiff of the scent when its dry. Overall, I think the April bag is absolutely perfect. I wouldn't have either of these shades as my colors for my wedding, but I could see how so many people would love it. The colors are perfect for Summer and that lip balm is my favorite that I've purchased in a while!